Microsoft is continuing its open approach to cloud storage by hooking more third-party services into Office. The integration is only available in Office for iOS today, but Microsoft is working on bringing the expanded cloud storage support to its Android- and Windows-based Office apps. 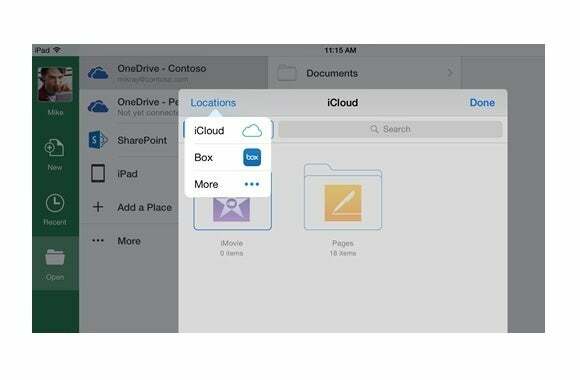 With the latest updates for Word, Excel, and PowerPoint, users can open documents straight from services like iCloud Drive and Box, then edit and save the documents back to Apple's service. This could be useful if you use Office on a Mac and have turned to iCloud Drive for your online storage needs, or if your business makes regular use of Box storage on other devices. However, Microsoft's implementation is limited. While you can use these third-party services to open existing documents, there doesn't seem to be any way to save new documents to iCloud Drive or Box. Getting to your existing iCloud documents is also a bit awkward, as you must go to the Open tab, then hit More to view iCloud files. If you want to use other services like Box, you must then hit Locations > More to enable it. Neither service shows shows up under the main Places menu, like Dropbox and Microsoft OneDrive do. Microsoft says it will support more third-party storage services in the future. In fact, if you have Google Drive installed, it already appears as an option when you tap More > Locations > More from the Open tab. Enabling it just doesn't actually do anything at the moment. Why this matters: When Microsoft added Dropbox support last year, it seemed like a strategic decision to work with an already-popular cloud storage provider. But by expanding support to even more services, it's now clear that Microsoft isn't trying to pick winners and losers. Instead, it's simply looking to make users' documents more readily available on a wide range of services. Let's just hope future versions can do a better job with document creation.